The Capital Region is filled with natural beauty, business opportunity, distinguished culture and a variety of entertainment choices. Whether you prefer the villages, suburbs and quaint countryside settings of Saratoga County or the bustling downtowns of Albany and Saratoga Springs, you will be happy at home in the Capital Region. 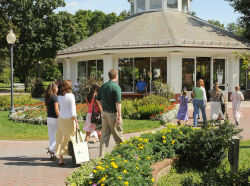 Award-winning schools and higher education institutions make this community an ideal location for families and friends. From here, you can be anywhere. Located in the heart of Saratoga County, the Luther Forest Technology Campus is an ideal location in the northeastern US. Major city centers, including Boston, New York City and Montreal, are an easy three hour drive. Locally, the Campus is located near great cities, like Saratoga Springs, Albany and Troy, and charming villages, such as Ballston Spa and Round Lake. You’ll never be too far from work, shopping, restaurants and schools when you live here. The Capital Region is city and country, four-season, beautiful, and energized, but always serene and a great place to relocate your business and your family. When you live in the Capital Region, education is top notch and all about choice. Many families choose the area’s high-quality public school systems, which offer dedicated teachers, up-to-date physical facilities, notable academic resources, and extracurricular activities including sports, arts, and enrichment programs. If you prefer a private school, the Capital Region is home to nationally recognized elementary and secondary schools. Religious and faith-based schools are yet another option for families living in the area. In addition, the Board of Cooperative Educational Services (BOCES) offers trade-specific courses. Many public schools also offer specialty courses, such as the Ballston Spa School District’s nanotechnology and renewable energy curriculum. When you live in the Capital Region, you’ll be close to some of the finest art collections anywhere. The Empire State Plaza is reputed to have the largest contemporary public art display in the country. The New York State Museum has both historic and nature displays and features traveling exhibits from major museums. The recently-renovated Albany Institute of History and Art is the oldest museum in the country. In addition to these Albany-based museums, there are many prominent collections, including the Hyde Collection in Glens Falls. The Capital Region is truly four-season. Whether you enjoy golf, cycling, equine sports, whitewater rafting, motorboating or sailing, the spring and summer seasons are packed with recreational opportunities. Winter and fall in the Capital Region bring just as much opportunity for fun with countless locations to cross-country or downhill ski or hike through the beautiful Adirondack Mountains. Pockets of green abound in our cities and New York is home to numerous state parks. Residents can access state-of-the-art healthcare through a number of organizations that serve area residents. As the only hospital and largest healthcare provider in Saratoga County, Saratoga Hospital offers comprehensive inpatient and outpatient services through multiple sites. Based in Saratoga Springs, Saratoga Hospital provides cardiac catheterization, radiation oncology, a free-standing surgery center and a regionally recognized minimally invasive surgery program - with a specialty in robot-assisted surgery. For tertiary healthcare needs, Albany Medical Center Hospital in Albany is the Capital Region's academic medical center with an affiliated medical school and a research focus. As the region's only state-designated Level 1 trauma center, Albany Medical Center's Emergency Department (ED) is a critical community resource. The entire region has a variety of high-quality hospitals and other healthcare providers, large and small, offering many healthcare choices for residents. And then there’s the music. Within a 60 mile radius, the Capital Region proudly boasts of three symphony orchestras—in Albany, Schenectady and Glens Falls—and noteworthy venues including the acoustically renowned Troy Music Hall, Proctor’s Theater in Schenectady, the Palace Theater and the Capital Repertory Theater in Albany. Of course, come summer, the Saratoga Performing Arts Center (SPAC) is the summer place to be to enjoy an evening at the New York City Ballet or listening to a concert by the Philadelphia Orchestra. Mainstream and contemporary music acts frequently visit both SPAC and the Times Union Center in Albany. History buffs can take heart as well. Throughout the Capital Region, an area with a 300+ year history, you can explore numerous historic sites and houses. The landscape itself, with the Hudson and Mohawk Rivers flowing through it, tells a tale of past adventures and the settlement of America.